The cold weather means uncomfortable working conditions. Roofers work long, hard hours during the warmer months, and some appreciate having the colder season off. Snow and ice bring safety concerns. They can usually be mitigated with proper training and the use of personal protective equipment, but some roofers avoid taking the risk altogether. The demand for roofs usually reduces during the winter months, so roofers may shut up shop. Roofing can be done throughout the winter, but there are a few important changes to the process and application. Below, we’ve broken down the key considerations for replacing your roof in the winter. First and foremost, the safety of the workers is top priority. An experienced, safety-focused roofing company will take the necessary steps to clear the snow and attach safety lines for all workers. A good roofing company will provide workers with additional harnesses and gear alongside the standard safety equipment. It’s also important to make sure that the slopes are cleared of ice and snow, and that employees are working with optimal visibility. With safety always in mind, read on to find out about the two major roof types and the different things to take into consideration for each of them when thinking about winter projects. The slope, or pitch, of a roof can exponentially increase the risk to workers in even the best conditions. The steeper the incline, the more difficult it is to attain and sustain stability. Adding ice into the mix increases the risk of slipping, falling, and dropping equipment. Many sloped roofs are shingled, and there are a few extra things to think about when putting them up in cold weather. During winter installation, proper nailing is very important. As the reinforced fiberglass shingles get cold, they become increasingly brittle. It’s essential that roofers take extra care when nailing the shingles to prevent unnecessary damage. Best practice is to either hand nail, or use a pneumatic nail gun properly adjusted to drive the nails to a proper depth. An experienced installer will know how to control the PSI to avoid driving the nail completely through the shingles, head and all. It is also very important that you have a qualified and trusted installer who knows to nail on the double layer of the laminate shingles to ensure strength of the application. Make sure that the installer is not “high nailing,” which will increase the chances of shingles blowing off and not bonding correctly. Many homeowners are concerned about the bonding of the shingles in the cold weather, but their concern is unfounded. The new “Fast Lock Sealant System” used by many companies means that they bond within a few hours during warmer conditions, and within a few weeks when it’s colder outside. The shingles only need the heat from the inside of your home and the warmth of the sun to start bonding. With this sealant system and the double-layered nailing area, many shingles can be installed securely in winter. If you're still concerned about installing a new roof in cold weather, choosing a premium shingle will help ease your mind. The newest shingles come with carbon fiber nailing areas that help prevent nails blowing through the shingles and high winds ripping through the nail holes. 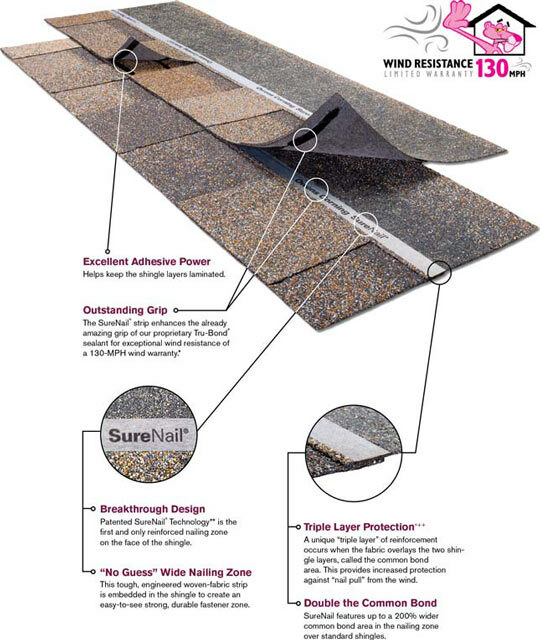 These shingles have a 1”-1¼” strip designed to prevent nail blow-throughs, and protect against the effects of high winds. This goes beyond the performance of fiberglass, and reinforces the stability of the nails. When working on a flat roof, it’s essential to adjust your equipment and procedures accordingly. Observing safety standards is equally important on flat roofs as it is on sloped roofs, and you’ll need to carefully assess the project prior to proceeding. A strong flat roofing system starts with installing a layer of polyiso insulation. The best way to apply this is to stick it to the roof deck with adhesive. During warmer months, this provides a strong, long-lasting hold. However, when it’s colder, the insulation won’t bond as intended. The alternative to the adhesive is mechanically fastening the polyiso. Mechanical attachment involves screwing it directly into the roof deck and fastening it at equal distances to properly secure it to the roof. This is not as strong as the adhesive, but it is a less labor intensive application, and cheaper too. Work on flat roofs can be done almost all winter, especially with the use of modified bitumen torch down roofing. This type of roof consists of a two-layer membrane that is attached using the heat from a torch. This means that the roof can be installed in any temperature, with the torch heating up the membrane and making it pliable whenever, wherever. TPO and PVC are single-layer membranes. They can both be installed in the winter using heat welding, but lower temperatures may inhibit the ability of these products to stretch and stay pliable. Talk to your roofer prior to moving forward with this process when expecting a serious drop in temperature. Are you struggling with the decision to repair or replace your roof during the winter months? The experts at Roofr can help! We can answer your questions, perhaps set your mind at rest and help you come up with a plan that works for your home and your budget. Call us at 416-587-5613, or reach us directly at info@roofr.com today!